We are very grateful to him because of everything he does for us, and that is why we are writing this text. 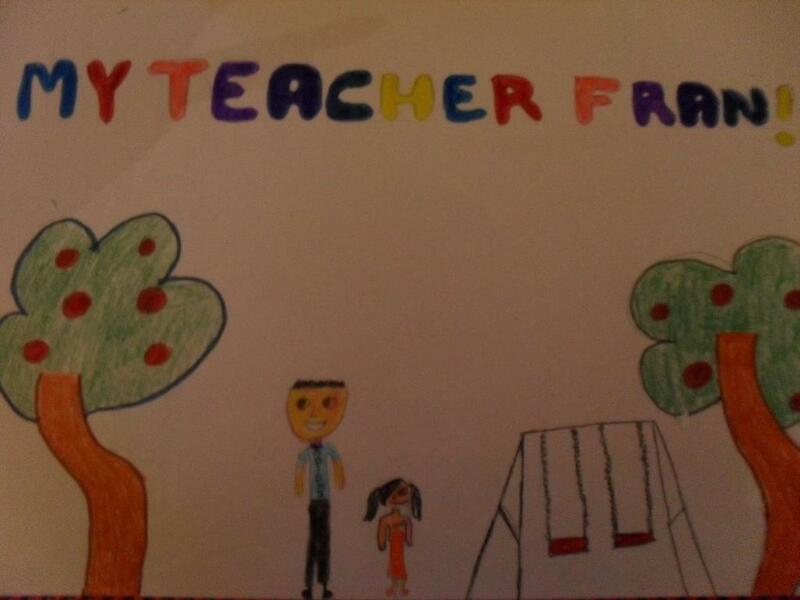 Our teacher Fran is very nice, he cares about us a lot, tells us how to do things better and besides helping us, he helps himself, because when he is finished with his teaching practice, he will be able to work at a school, and that is his greatest wish. We don’t want him to leave because we like him and he helps us a lot. Even though he has to leave and we will be very sad, we will also be happy because he would have fulfilled his dream of being a teacher. Mi profe Fran es un nuevo profesor de prácticas que ha venido este año a mi colegio. Nosotros estamos muy agradecidos con él por todo lo que hace por nosotros y por eso le estamos haciendo este texto. Nuestro profe Fran es muy simpático, se preocupa mucho por nosotros, nos dice como hacer las cosas mejor y, además de ayudarnos a nosotros, también se ayuda a sí mismo, porque cuando termine las prácticas ya puede ir a trabajar a un colegio, y ese es su mayor sueño. Profe, te echo de menos. ¿Cuándo vas a venir a visitarnos?